Ideally, every student would be given a copy of the Career Choices text to complete and take with them into the world. However, many schools simply don’t have the funds to make this possible. For this reason, the Workbook and Portfolio was created. 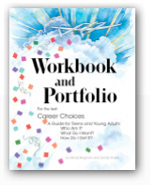 The Workbook and Portfolio is an inexpensive compilation of the activities contained within the Career Choices text, and it should be an integral part of any program. What makes the Workbook and Portfolio so important? The Workbook and Portfolio contains all the Career Choices exercises, so young people can review the key concepts as they revise and refine their plans. The ultimate goal of Career Choices is not for students to create a final agenda for their lives, but for them to learn a process. Then, as their interests, abilities, and ambitions expand, or as new challenges or opportunities arise, they can repeat the process. The Workbook is a comprehensive, permanent record of students’ Career Choices experience. How many of your students’ notes are thorough enough to still make sense two months later, never mind two years later? This is precisely why providing each student with a Workbook and Portfolio is so important. Loose papers and notebooks are not viewed with the same importance and respect afforded a printed text. The Workbook and Portfolio and My10yearPlan.com® help student practice the writing process. The planning process students begin in Career Choices is a work in progress, so responses will likely go through several editorial stages. The Career Choices Workbook and Portfolio is where students will create their draft for each activity, and My10yearPlan.com® is where they’ll review, edit, and polish that draft.